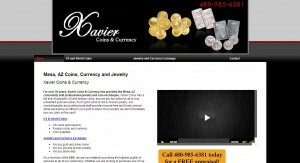 Xavier Coins & Currency address, phone, website, hours of operation, and more. 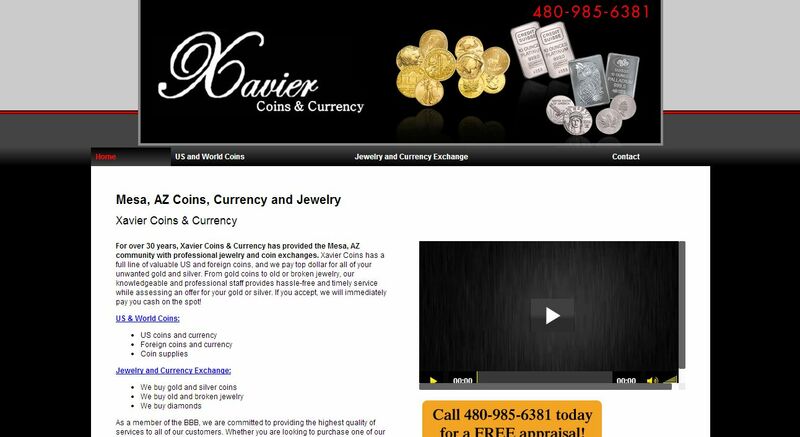 For over 30 years, Xavier Coins & Currency has provided the Mesa, AZ community with professional jewelry and coin exchanges. Xavier Coins has a full line of valuable US and foreign coins, and we pay top dollar for all of your unwanted gold and silver. From gold coins to old or broken jewelry, our knowledgeable and professional staff provides hassle-free and timely service while assessing an offer for your gold or silver. If you accept, we will immediately pay you cash on the spot! For over 30 years, Xavier Coins & Currency has provided the Phoenix Metropolitan community with professional jewelry and coin exchanges. Xavier Coins has a full line of valuable US and foreign coins, and we pay top dollar for all of your unwanted gold and silver. From gold coins to old or broken jewelry, our knowledgeable and professional staff provides hassle-free and timely service while assessing an offer for your gold or silver. If you accept, we will immediately pay you cash on the spot! As a member of the BBB, we are committed to providing the highest quality of services to all of our customers. Whether you are looking to purchase one of our valuable US or foreign coins, or you are interested in selling your unwanted jewelry, we will provide you with service you can trust — and offers that can’t be beat!